Tribune Chronicle / John Vargo Youngstown State’s Devin Morgan (22) pressures Oakland’s Braden Norris Thursday during the Penguins’ 75-74 win at Rochester, Mich.
ROCHESTER, Mich. — Michael Akuchie is there in the gym, about 30 minutes after a Youngstown State University home game. He’s bouncing the ball, shooting short, mid-range and 3-point shots, working on all facets of his game. John Sally is there as well. He hones his craft constantly, trying to bide his time until his number 50 is called to the court. 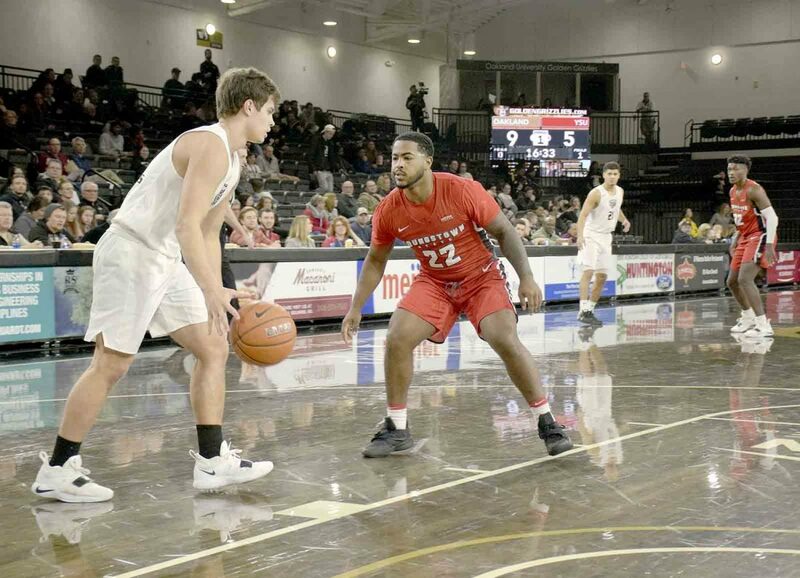 On Thursday it was in a 75-74 men’s basketball win at Oakland University. The two combined for 21 points, 11 rebounds and two blocked shots, both by Sally off the YSU bench. 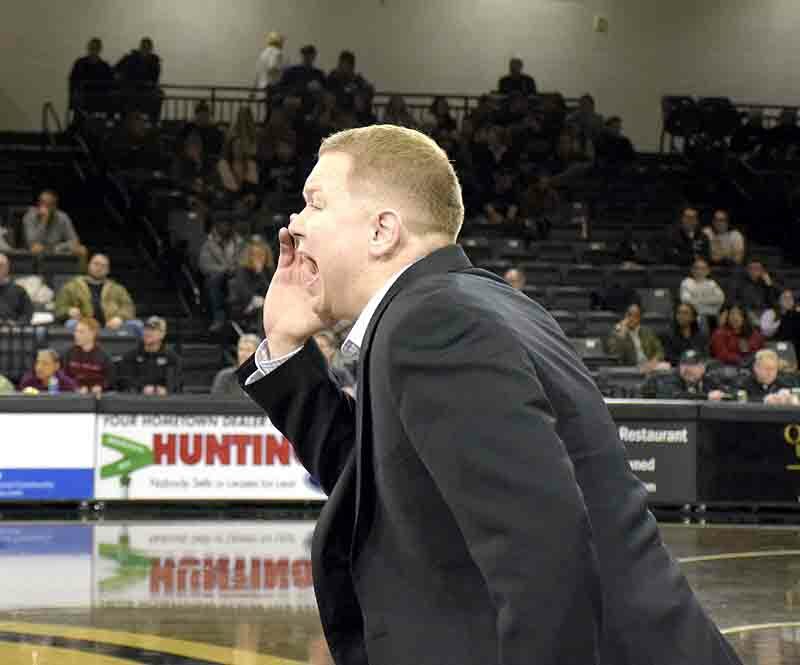 The Penguins (7-16, 3-7 Horizon League) manhandled the Golden Grizzlies in bench points, 38-11. 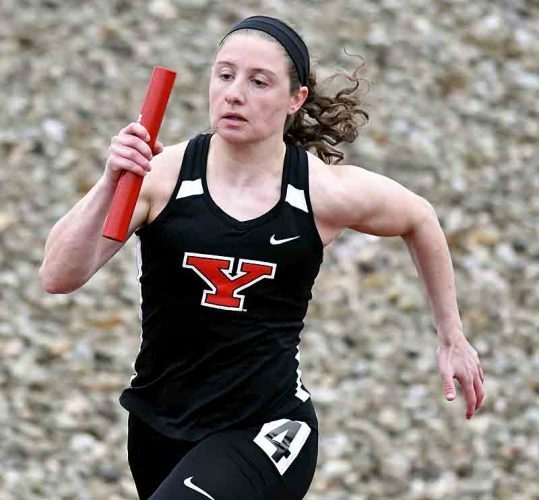 YSU coach Jerrod Calhoun, whose team snapped a three-game losing streak, saw how both Sally, a 6-foot-11 redshirt freshman, and Akuchie, a 6-8 sophomore, made their presence known against an Oakland team known for its dominant low-post game. 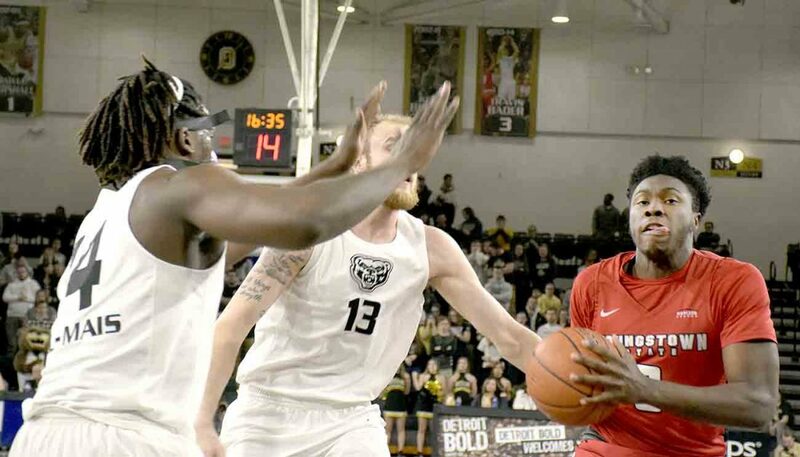 YSU outrebounded the Golden Grizzlies (10-13, 6-4), 41-40, and had a 16-12 edge in offensive rebounds. 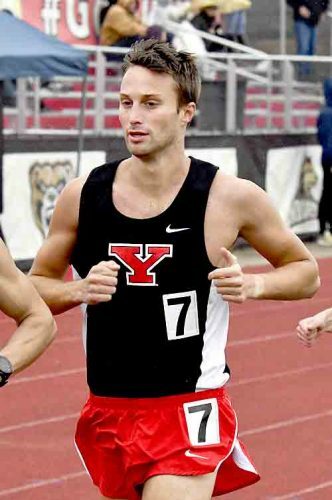 Tribune Chronicle / John Vargo YSU coach Jerrod Calhoun calls out instructions to his team Thursday against Oakland. “We told ourselves stay with it, stay together, just keep rebounding, get stop by stop and you’re going to come out with a win,” said Akuchie, who had 11 points and nine rebounds. The Penguins were sacrificing their bodies for most every loose ball in the second half, trying to keep it out of the hands of Oakland and 6-11 Brad Brechting, who did his damage with 21 points and 18 rebounds. Quisenberry, arguably one of the best freshmen in the Horizon League, constantly drove at the basket in the last 10 minutes. Devin Morgan hit a 25-footer with 12:10 left to tie the game at 50. Sally’s jumper from the wing gave YSU a 56-54 lead with 7:40 left. Quisenberry got the ball to Garrett Covington on an inside-out play with 5:09 left as Covington buried a 3-pointer. He had 11 points and was 3-of-6 from the floor, 3-of-3 from 3 and 2-of-2 from the line. Tribune Chronicle / John Vargo Antwaun Maxwell, Jr., right, of Youngstown State drives against Oakland’s Brad Brechting (13) and Xavier Hill-Mais Thursday night. Quisenberry had a key swing as he drove with 1:49 left, tying the game at 66. He then stole the ball and dished it out to Covington for another 3 as YSU led 69-66. Quisenberry drove again with 1:09 remaining and was fouled. He didn’t complete the three-point play. It was one of three straight missed free throws. Braden Norris made the back end of two free throws with 4.9 seconds left. Kamari Newman fouled Quisenberry on the inbounds 0.5 seconds later. This time, the freshman from Springfield did not disappoint, making both ends for a 75-71 lead. 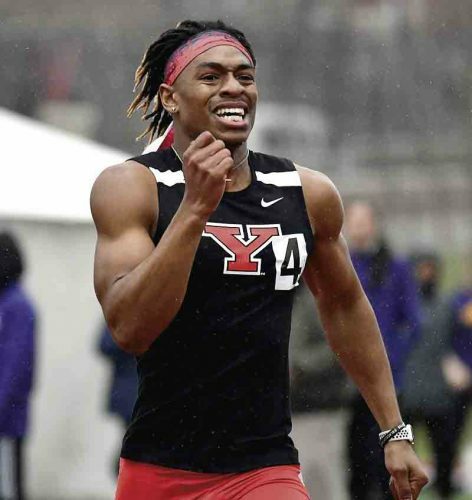 Jaevin Cumberland, who had 19 points, made a 3 at the buzzer as YSU came away with a one-point win. 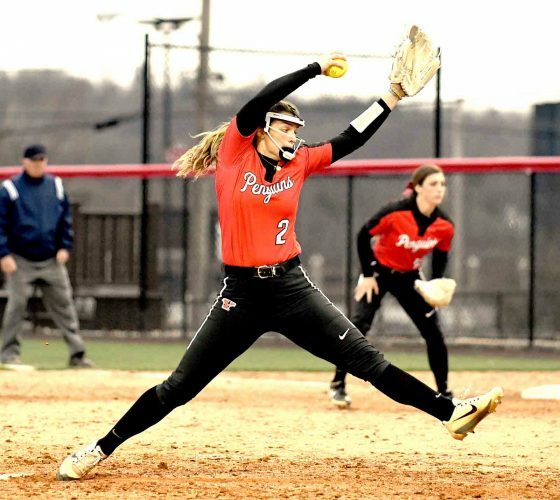 He went 30 minutes south to his hotel since YSU has a game Saturday at 1 p.m., at Detroit Mercy. During the game, Quisenberry told Sally not to go for blocked shots. It was about playing fundamental defense. He had 10 points off the bench, a career high. That’s what teammates do, look out and help one another. “My coach, coach (Rollie) Massimino told me good things are going to happen to good people,” Calhoun said. “Both John and Mike are really good people. They’re really good teammates.